Today in Egypt, human rights activists, lawyers, political activists and independent journalists, all have to live with their phone calls being tapped, endless smear campaigns and hate speech from state-affiliated media as well as continuous harassment and intimidation from the authorities. Egypt is going through the most serious human rights crisis in its history. Every day security forces arbitrarily displace 3 or 4 people (AI Secretary General, 18 Dec. 2016). After the overthrow of President Mohammed Morsi the human rights situation deteriorated dramatically. The government severely restricted freedom of expression, freedom of assembly and freedom of association. The authorities have taken harsh actions against dissidents, tens of thousands have been arbitrarily arrested, and many of them tortured during custody. Security forces who killed demonstrators have not been held accountable. After harsh unfair trials, hundreds of people have received prison or even death sentences. Victims of this persecution include not only alleged members and supporters of the Muslim brotherhood but also any other opponents to the present government, in particular alleged members of left-wing organizations and human rights activists. 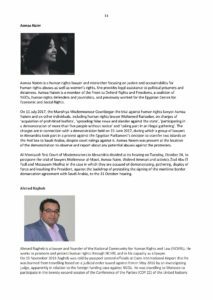 This relentless persecution can even lead to arbitrary arrest, prolonged detention, harsh sentences after unfair trials and sometimes even torture, enforced disappearance at the hands of the state or death in custody as a result of medical negligence. This is pretty much the same list of human rights violations suffered by the people whose rights such defenders are meant to be protecting through their activism and work. 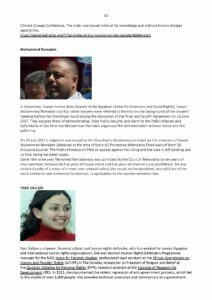 Victims of this persecution are not only alleged members and supporters of the Muslim brotherhood but also any other opponents to the present government in particular alleged members of left-wing organizations. Since General Al Sissi came to power, the crackdown on the Muslim Brotherhood has spread to the entire democratic opposition, the media, NGOs, minorities and civil society. Lawyers pay a heavy price. Many of them are victims of arrest, conviction, threats, travel bans from the territory and other restrictions on the practice of their profession. By so doing, the Egyptian government violates the UN Basic Principles on the Role of Lawyers, adopted by the Eighth United Nations Congress on the Prevention of Crime and the Treatment of Offenders, Havana, Cuba, 27 August to 7 September 1990. 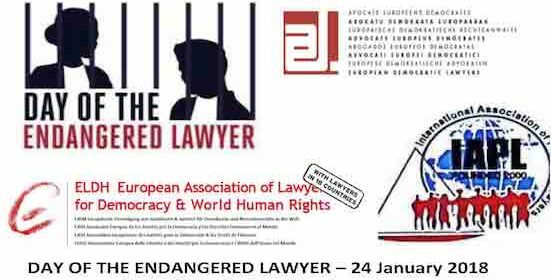 The AED calls for demonstrations in front of the Egyptian embassies all over Europe to show our solidarity with our Egyptian colleagues in the context of the Day of the Endangered Lawyer. The Day of the Endangered Lawyer is supported by the Foundation of the Day of the Endangered lawyer and the AED as well as by IAPL, ELDH, IDHAE, CNB-OIAD, CCBE, UIA, Endangered lawyers, Lawyers for Lawyers. It is supported by many Bar Associations all over Europe and outside Europe.